SelectSound are black sound barrier blankets that clients order to affix to their black ceilings to camouflage their soundproofing treatment. 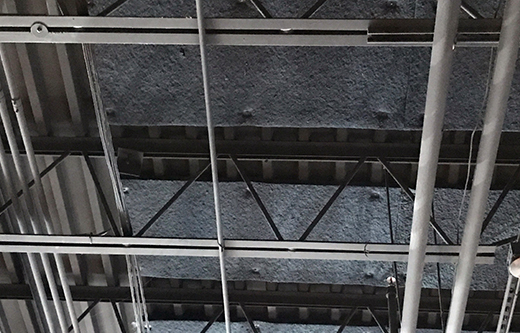 These rigid sound panel ships in 4’x8’ dimensions, measuring 2″ thick, and is installed flush to your ceiling with industrial strength adhesive and insulation pins. 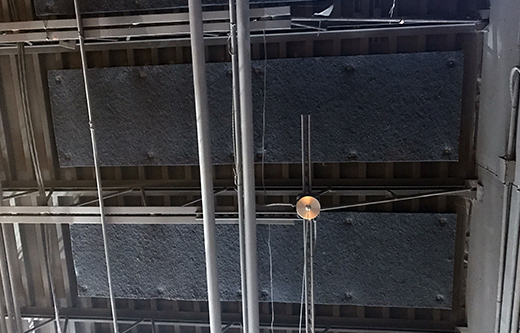 The bulk of our clients are restaurant owners with spaces that have black corrugated metal deck ceilings. 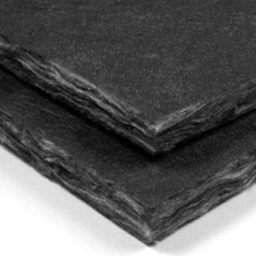 SelectSound black sound barrier blankets are class A fire rated, they will not shrink, warp, rot or corrode. SelectSound is an ideal sound panel treatment for any loud commercial space with a black ceiling surface. SelectSound is made from an all black fiber material encapsulated and sealed by a black mat surface. The key to the success of your soundproofing treatment using SelectSound is to ensure that the right amount of material is introduced into your space. To calculate that number, we run a free Room Analysis for our clients to help pinpoint the amount of square footage required based on a room’s size, shape and surface textures. Simply call our help desk at 1-800-638-9355 or complete our Room Analysis worksheet. SelectSound sells for $120 per 4’ x 8’ sheet. Orders can be placed by calling our sales desk at 1-800-638-9355 or by placing your order online using the link above. The ability to disguise your soundproofing treatment with this black-on-black sound panel is what makes SelectSound so popular. Note that there are other options also for a black ceiling. NetWell offers vertical black baffles called VET Baffles that could suspend from your ceiling vertically. We also offer sound panels that float horizontal, parallel to your roof line, called Ceiling Clouds that could “float” as a set of black clouds off your ceiling. SelectSound panels are glued to the ceiling with industrial strength construction caulk. If your ceiling is a corrugated metal deck, use insulation pins to help anchor the panels and reinforce the installation. The panels will deliver in 4’x8’dimensions, but you can cut them with a utility knife to smaller sections, and evenly place them across the expanse of your ceiling. 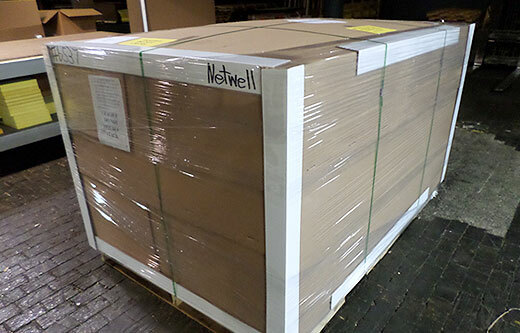 SelectSound panels ship in 4’x8’ sections that measure 2dz thick. 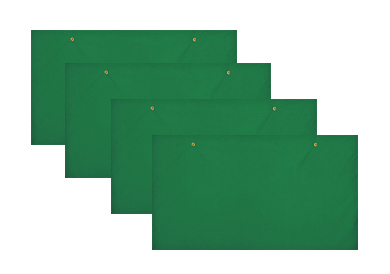 They will be shrunk wrapped and shipped on pallets via common carrier direct to your project site. For questions related to your installation, call our help desk at 1-800-638-9355. For clients unsure of the quantities required to trigger the sound values they are seeking, we offer a free Room Analysis tool to help define the framework for their treatment and quote the project back. Use this form to submit back the dimensions of your room and NetWell will quote your SelectSound project back. The goal is to make sure we introduce the right amount of panel into the room. If we under do it, the sound values back will decay.